This is the 5th annual all-female triathlon designed to raise awareness about early detection of breast cancer, research into eradicating the disease, recognizing the survivors and those living with breast cancer, and remembering those who have been lost to this terrible disease. 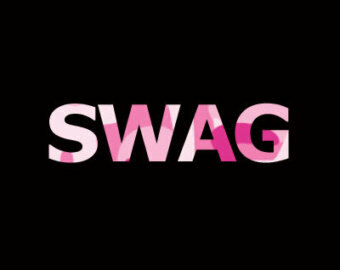 The proceeds from the event are donated to local breast cancer organizations to fund breast cancer research and awareness activities. The past four years, the event has contributed several thousand dollars to local breast cancer charitable organizations through your participation in this triathlon. Advance Packet Pick-up Dates and Times. Note: Please Bring Drivers license or proper I.D. 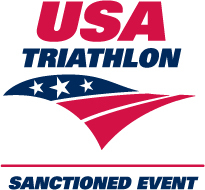 If a USAT member please bring your USAT membership ID card. NOTE: If use Google Maps for directions, it will take you to vicinity but to the road section prior to the Health Center. The Health Center is located just North of Mennard's on SR 23. 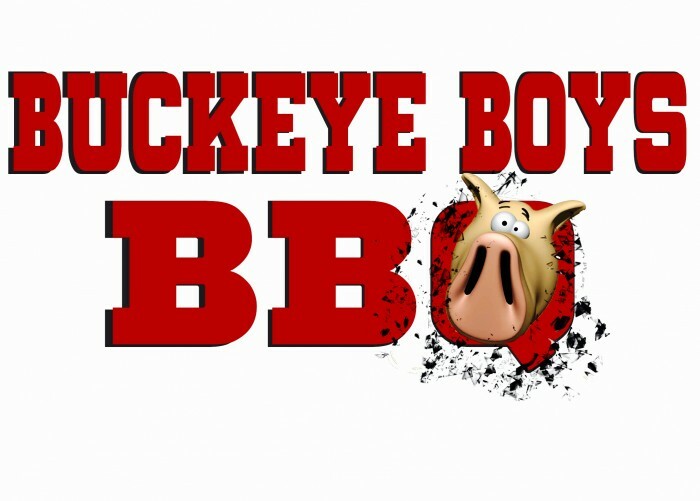 Stick around after your Triathlon For Hope for a great celebration featuring the award ceremony, music, and great food hot off the grill courtesy of our friends at Buckeye Boys BBQ. Note: Reference age-up rules for all age division participants. Your age division and event start wave is based on your age as of December 31 of that year. For example, if you are 39 on the day of the race but will be 40 by December 31st, your wave and age divsion is 40-44. Failure to participate and start in the correct wave will cause your time to be inaccurate and impact division results. For the Triathlon, the top finisher in each age division, athena, and relay team are eligible for awards. Awards will be handed out at the post-event award ceremony. No awards will be mailed or delivered. IMPORTANT: It is important that you begin your event in the proper event wave. As example, If you are 39 on the day of the race but will be 40 by December 31st, your wave and age divsion is 40-44. For the Duathlon, only the top three overall finishers will receive an awrd commemorating their finish. Important NOTICE: Awards are ordered 10 days in advance of the event. Award divisions not represented will not have an award ordered if no division entrants as of the order date. Participants must wear assigned number on the front of your shirt or shorts. Your number must be visible to checkpoint recorders at all times. Attach timing chip to your ankle with the provided strap. You will not be scored at the finish line unless your number is visible and your timing chip is attached when you cross the finish. Bike Helmets are mandatory. No exceptions. If Bike Helmet and bike numbers have been assigned, they must be secured to equipment. Once the transition closes you will be required to display assigned race number to enter and exit the transition or remove any equipment. Swim Caps colors and numbers will be assigned and must be worn. You will not be able to start the swim without your swim cap. 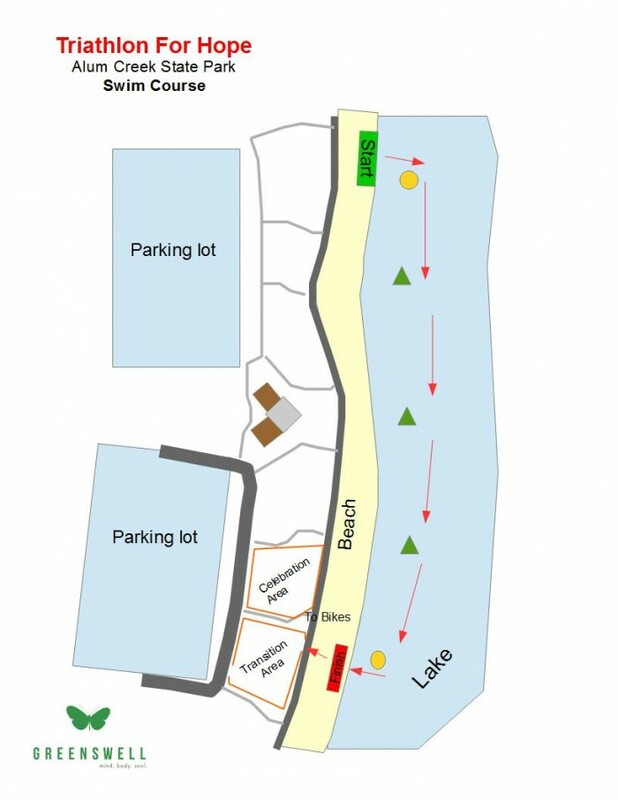 The triathlon starts at the northern end of the Alum Creek Beach with an age group dash into the reservoir. 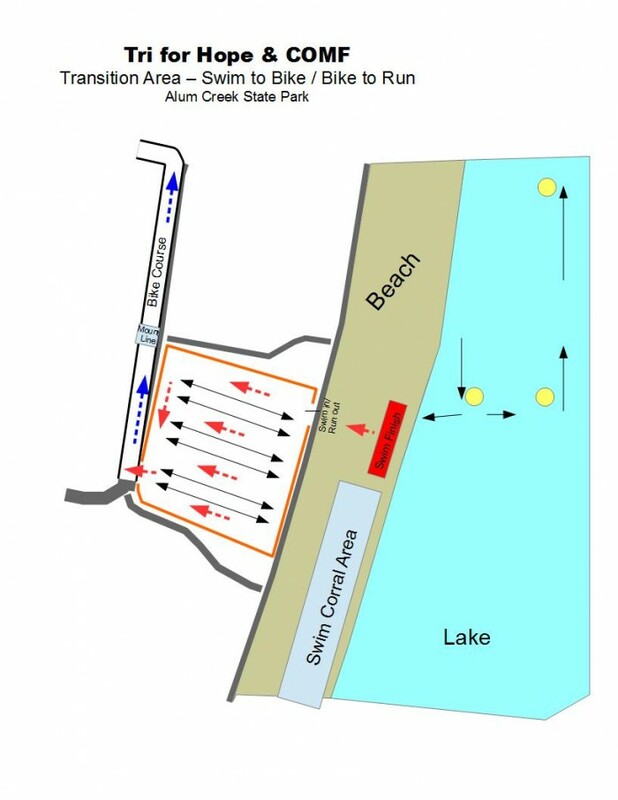 Triathletes will swim parallel to (3-5 feet deep water) or south along the Alum Creek Beach for 0.25 miles before returning back to the beach at the south end and into transition. 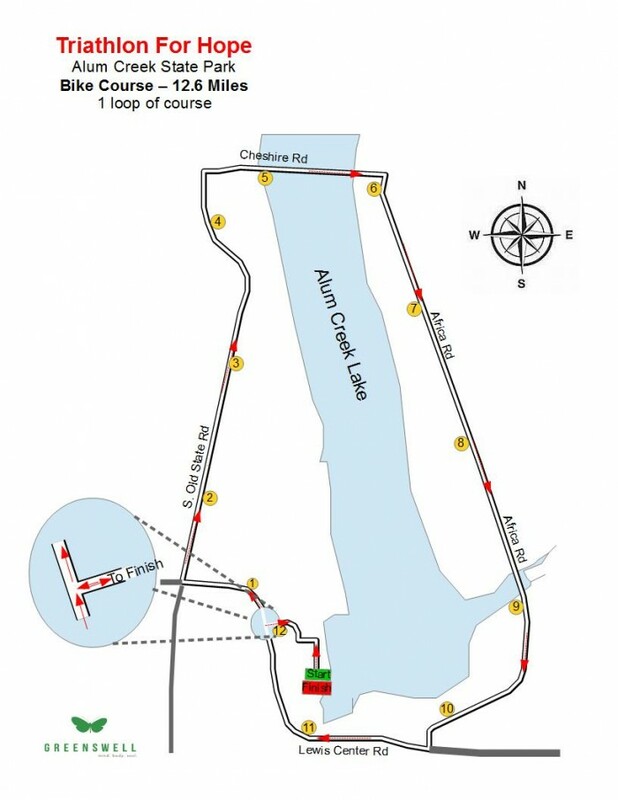 All participants then begin the exciting bike portion ... head out of Alum Creek State Park, turn RIGHT onto Lewis Center and then turn RIGHT onto Old State to Cheshire and again turn RIGHT. Then cross over the reservoir via the Cheshire Bridge to Africa Rd. Turn RIGHT and head South on Africa Rd and begin a very fast 5 mile stretch to Lewis Center Rd. At the intersection of Africa Rd and Lewis Center Rd, turn RIGHT, pass by the Below the Dam area and begin a .25 mile, grade 6 climb back to Alum Creek State Park. Participants will re-enter the park and head into transition. Participants will then begin the final leg of their Greenswell Triathlon For Hope experience. Runners and walkers will turn RIGHT out of transition and onto the path that separates the sand from the grass along Alum Creek before heading out onto the grassy and wooded trail to reach the top of the Alum Creek Dam pathway. All runners and walkers will turn LEFT onto the pathway and travel along top of the dam to the 1 mile turnaround sign. Participants will turnaround and return back the same way they went out back toward the finish line. 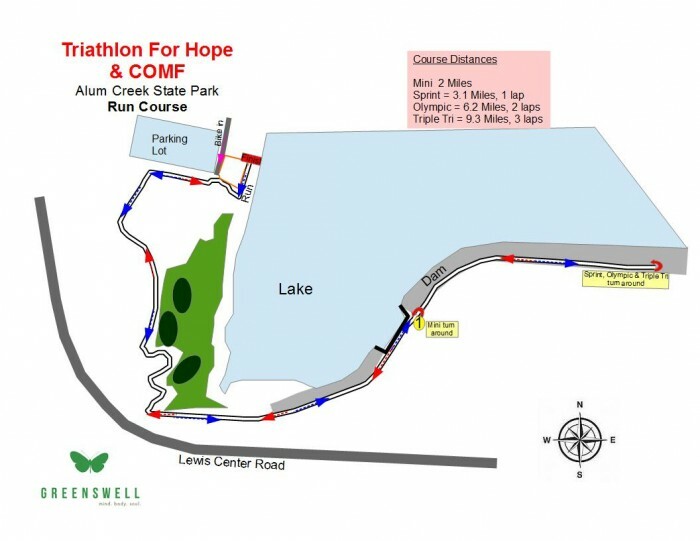 All participants, after completing their respective run distance will be able to see the finish line at the final 0.3 mile as they begin their final push to the finish line along the Alum Creek reservoir as they complete their Greenswell Triathlon For Hope experience!